Happy smoothie season, everyone! 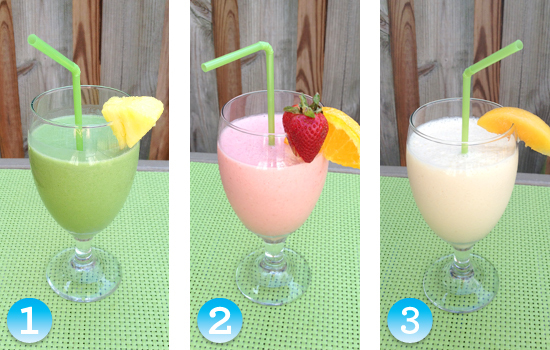 I personally drink the frozen fruity concoctions year-round, but for those of you just firing up the blenders for spring, I thought I’d share my formula for the perfect 12-ounce smoothie, as well as three of my favorite recipes that are especially beneficial for pregnant women — not to mention tasty, refreshing and filling. I set my blender carafe on a kitchen scale to measure everything in ounces as I add it, since it’s easiest and most accurate that way. I start my blender on the lowest speed and gradually increase it until the mixture is nice and smooth, after about 30 to 45 seconds. 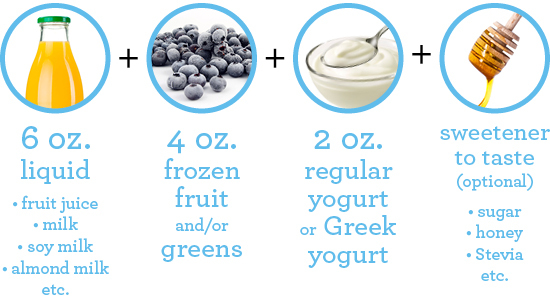 You could create literally millions of different smoothie variations based on this formula, but here are three healthy combinations to help get you started. Eating Well When You’re Expecting recommends that pregnant women consume three to four servings of green and yellow vegetables and fruits daily because they’re rich in beta-carotene, fiber and many essential minerals. The mango and spinach in this smoothie count for at least one serving; plus, you get protein and calcium from the Greek yogurt, and Vitamin C from the pineapple juice. Now, I’m not going to lie to you — you can taste the greens. If you want your smoothie to remind you more of relaxing on the beach than mowing the lawn, use four ounces of mango and skip the spinach, or start with just a little spinach and work your way up. Strawberries and orange juice are both excellent sources of Vitamin C, which is one of the most important vitamins for expecting moms. Among other attributes, Eating Well says it’s essential to the production of collagen for your developing baby, it helps in the absorption of iron, and it may help you resist infection. The milk in this smoothie pumps up the calcium content and gives it a smooth, creamy taste. Enjoy, and let me know what other combinations you come up with!